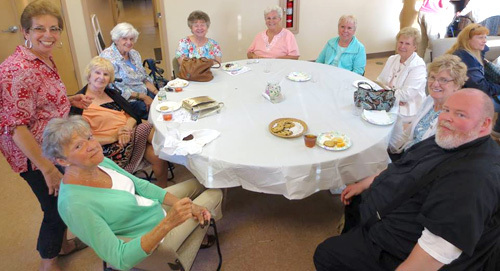 Dominican Sisters Margaret Mayce, Margaret Galiardi, Jane Doherty, Rita Lombardi, Peggy McVetty, Margaret Sammon, Christine Sammons (Amityville) and Valerie Shaul (Peace) joined parishioners, clergy, and other women religious for a Year of Consecrated Life celebration at St. Bernard’s Church in Levittown, New York. 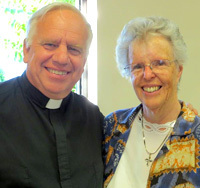 In 2013, Pope Francis declared that a Year of Consecrated Life (YCL) be celebrated throughout the world, beginning Nov. 30, 2014, and closing Feb. 2, 2016. This recognition of Catholic sisters, brothers, and priests is intended to foster understanding of the lives and ministries of vowed religious in the Church today, and to promote vocations to consecrated life.